what do you guys think of this sh? lmk what you guys think of this sh. do you like the paint? 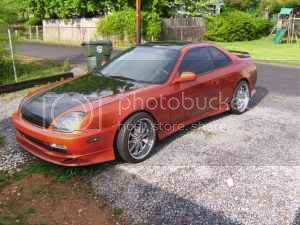 or do think its ricer? Re: what do you guys think of this sh? Personally, I like how that Prelude looks overall. It looks like there are wheel spacers on it? If so, I do not favor wheel spacers, that is my taste for wheel spacers. The paint job is acceptable. The color orange is unique for me because in my area, I mainly see black, white, or red colored 5th gens cruising. Finally, I do not think that Prelude is not too rice. For me, rice is not knowing your limits by applying ridiculous mods. I would get rid of the rims since I do not enjoy flashy rims. Anyways, that's my honest opinion and my reasons, even though you did not ask to back up my opinion , about that Prelude. Also, If I own that Prelude, I would just flick off the parts I do not like. It's all personal opinions. If you don't like the paint then don't get the car. If you do, then it's up to you to make it whatever you want. I dont think the paint is bad. It wouldnt be my choice of repainting a car, but its unique and looks pretty good. Im with everybody else about the rims tho. Luckily u said it comes with stock rims. I think it really looks ricer. Id stick to the stock look. In all honesty it doesn't matter what we think. It's your purchase so its up to you and your opinion if you like it or not. Don't let other people sway your opinion. I have always let other peoples taste influence my own. It's not cool. But I kinda like it. I would change a few things but one seen a lot worse. I like the paint personally. If I had a carbon fiber hood I'd like to paint it the same way and if I could pick any color at the moment I want a metallic burnt orange. My taste may change in 6 mos, but right now that prelude is pretty damn close to exactly what I would want for my car (minus the rims). The wheels spacers might be necessary to make those rims fit without hitting the brakes. The user may have extended the lugs to facilitate. If he did would it look weird with stock rims, no spacers? And ya, $6k for a paint job? I guess if you're a house of kolor only kinda guy, lol. idk how much paint costs.... i looked at alot of places on the internet and they were saying expect to pay 6k to paint your car. 3k really isnt that bad. Other than that the car looks decent, and it is a unique color on a 5th Gen. Got any pics of the interior?